A Deal So Good It’s Scary! 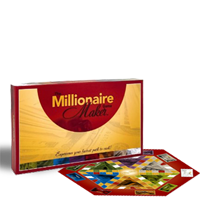 Get The Millionaire Maker Game At It’s Lowest Price Ever! Halloween’s just around the corner and what better way to spend some time with your family than to play The Millionaire Maker Game! When you get back from sifting through the goodie bags (and stealing a few choice pieces of candy from the kids…shhh), why not sit down together and have some fun while you learn! The Millionaire Maker Game is a board game for all ages – it’s interactive, educational and many times just plain enlightening! We’ve all had fun playing Monopoly, right? Players begin their path to riches with a wealth profile, ranging from debtors to cash-poor millionaires and everything in between. How rich will you be at the end of each round? It depends upon the decisions that you make along the way. Adults and children, as young as 10 years old, have been playing, learning, and having fun experiencing their fastest path to cash for months, and now you can too! In this dynamic, and educational game of creating Wealth Cycles™ like the wealthy do, you can kiss your W-2 job goodbye and live the life you want to live, not have to live. Assume the role of a character in the game. Model your dream business after a successful mentor’s. Buy a six-unit apartment building. Purchase a share of an oil well. Get sued by a disgruntled employee. And more. Like real life for an entrepreneur, the game is filled with opportunities and challenges. I am so committed to changing the conversation about money in this country that I just have to do it! Get Your Very Own Millionaire Maker Game! So What Are You Voting For? Alumni 16 – Will We See You There? A Deal So Good….It’s Scary! Would You Like An Extra $10k In Your Pocket?